October | 2011 | WHAT A FEELING! That’s right – What a Feeling! must pause for a few days. But you can’t possibly have read all the 1980s reviews here, so plunge into the thicket. We will return soon. My memories of Attack of the Killer Tomatoes (1978) are, I’m ashamed to say, hazy at best, although a few images, such as the giant tomatoes rolling through the streets and terrorizing the local humans, are indelible. But it was a sophomoric, badly acted, ultra low-budget movie with one basic joke: the audacious concept that tomatoes could kill. 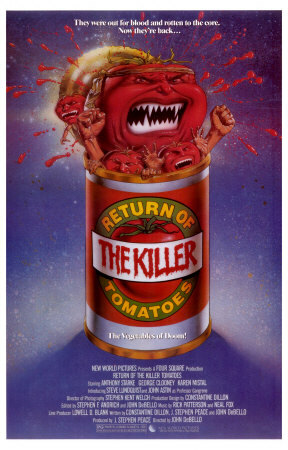 You’re not going to believe this, but the sequel, Return of the Killer Tomatoes, is a genuinely funny movie. I’m not quite sure how this happened, since the creator of Attack, John DeBello, is also very much at the helm here. With a little money, a professional look, and decent actors, DeBello has put together a spoof that lands somewhere near Mel Brooks at his middle range, just this side of Mad magazine. The movie repeatedly makes fun of itself. It opens as a TV-movie show, where the sappy host denigrates the film you’re about to see. Midway through the film, the actors are interrupted by the director, who announces that they’ve run out of money and must find some quick cash to continue filming. Thereafter, this movie becomes the best spoof yet of the practice of Product Placement, whereby companies pay money to have their products displayed in movies. The Pepsi logo promptly begins turning up everywhere. The story itself has two lunkheaded guys (Anthony Starke, George Clooney) doing battle against an evil genius (John Astin, gleefully hamming) who wants to—dare we say it?—rule the world. Astin’s creating a population of androids out of tomatoes, including a beautiful woman (Karen Mistral)—as someone remarks, “Boy, I’ll say she’s a tomato!”—who chews fertilizer and videotapes the daily farm report. It goes on this way, and it’s just fast and goofy enough to work on its lowbrow level. The movie’s a little long for what it is, but there’s always something going on, whether it’s a vegetable joke, the inexplicable shrine to Diane Sawyer in Astin’s laboratory, or the other exploitation movie that keeps cutting in: Big Breasted Girls Take Their Tops Off (which has its own theme song). There are just enough daffy jokes in this movie to make sure you’ll be playing (I’m sorry) catch-up. Still astonished that this movie turned out to be funny. Nice to see that a young fellow named George Clooney rated mention behind Anthony Starke—whose own career is still busy, by the way, if not at Clooney levels of visibility. As comic-book heroes go, Swamp Thing is surely a poor cousin to Batman, especially in this summer of blockbusters. You don’t see any full-color spreads in Newsweek about Swamp Thingmania. However, Swamp Thing also has a summer movie, and he acquits himself reasonably well, although admittedly at a lower level of ambition than the man in the cape. The Return of Swamp Thing brings us up to date on the status of the vegetative superhero, last seen in 1982’s Swamp Thing. Like that film, Return is a clever B-movie, delivered tongue-in-cheek. Louis Jourdan returns as the evil genius whose experiments have gotten out of hand in the bayou country. (In one scene he begins reciting lyrics from Gigi, which is either an index of how far this actor’s career has fallen or a measure of his healthy sense of humor.) His laboratory in the swamp is full of experimental cross-bred creatures, such as a cockroach man. Heather Locklear is his stepdaughter, who comes to his lab to investigate the mysterious circumstances of her mother’s death. Naturally, Jourdan takes one look at her and wants to use her for a genetics experiment. Director Jim Wynorski keeps things light. Locklear can’t act; when she’s called upon to sound anguished—”I seem to be haunted by things I can’t resolve”—she sounds as though she’s ordering a Diet Coke. But she can fill out an evening dress, which is the main requisite for the role. The summer of the Tim Burton Batman—now that was a big deal, if not a great movie. That anybody even thought of putting out a Swamp Thing sequel is kind of charming, and apparently it wasn’t terrible. The question about Louis Jourdan, by the way, seems to have been answered in favor of his healthy sense of humor. Director Wynoski, according to IMDb, is an extremely hard-working gentleman, having most recently made Piranhaconda for Roger Corman’s zany series of made-for-TV monster movies. 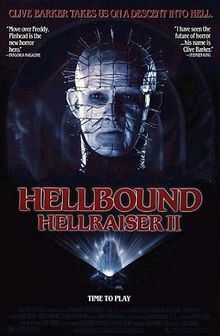 Hellbound: Hellraiser II was originally scheduled for Halloween release, which would seem to be a sensible course for a horror movie. But the film kept getting postponed, and now 1988 has run out of weekends. So here it is, just in time for Christmas. Actually, the timing of the release provides an interesting experiment. 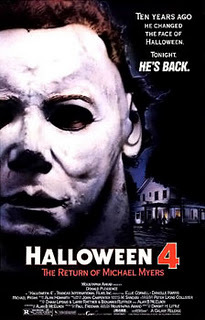 There have often been action films that did well during the Christmas season (Sudden Impact and 48 HRS., for instance), but horror movies have not turned up much during the holidays. Will Hellbound tap the roving, restless out-of-high-school crowd, or will it be lost among the joyful tidings? Whatever happens, the movie itself is a provocative entry in the horror genre. The first Hellraiser was written and directed by Clive Barker, the talented author of a number of volumes of horror (or Books of Blood, as some of his collections are known). Barker is credited only as executive producer on Hellbound, though it is taken from a story of his. The director here is Tony Randel. Hellbound gets off to a cloggy start, as it’s necessary to catch us up on what happened in the first movie; we see a few clips of the more revolting sequences (hey, if you’ve paid for the special effects, why not use ’em again?). We find the teenage heroine (Ashley Laurence) from the first film in a mental hospital. Then we are introduced to an exceptionally perverse doctor (Kenneth Cranham) who enjoys drilling into peoples’ brains, apparently for the sheer fun of it. This guy chants an incantation, and summons up one of the characters from the first movie, played by the spooky English actress Clare Higgins, who was last seen on her way to hell. She returns, but unfortunately without any skin. Yeccch. She looks like that model kit, The Visible Woman. This film manages to recapture the devilish humor of Hellraiser, but also veers off into some pretty startling territory; the last half-hour ventures into a hell full of Escher-like labyrinths, weird multi-limbed creatures, and big orchestral music. Like Hellraiser, the film is admittedly something of a mess, but students of horror will want to see it. Bring a strong stomach. And they’re still churning these out! Some of which haven’t been bad, although I haven’t kept my Pinhead-watching up to date. Among other things, Clare Higgins, a mighty actress of British stage and screen, seems to be a very good sport. The last days of November traditionally are a dumping ground for films that the studios have written off as lost causes. These films are either bad or uncommercial (or both). Thus they are plugged into empty movie theaters, with minimal advertising bother, to mark time before the biggies are let loose. This last weekend brought us a pair of films that fall neatly into the dumping-ground category. Coincidentally, they share a classic theme of outraged science-fiction movies: the government experiment that goes horribly awry. In Impulse, an absolutely typical American small town is seized by a mysterious force that causes the residents to alter their behavior. 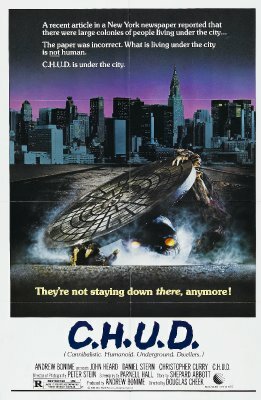 In C.H.U.D., New York City is besieged by toxic-waste monsters in the sewers. If the locales (and the production values) are different, the dynamic is similar: post-Watergate paranoia, fueled by a fundamental mistrust of the government. The director of Impulse, Graham Baker, says he wanted to pose the question: “What is wrong with this Norman Rockwell picture?” Just after a slight earthquake, the people of the little hamlet of Sutcliffe begin acting up. Kindly old codgers start cussing each other out on the street. A woman enraged by a minor traffic violation rams her car repeatedly into the offending vehicle. The sheriff guns down a little kid for ripping off parking meters. These weird events are seen by a young couple (Meg Tilly and Tim Matheson) making an unscheduled visit. They’ve been brought to Sutcliffe—it’s Tilly’s hometown—when her mother, while making a venomous and obscene phone call to her daughter, shoots herself. Matheson, a doctor, suspects a communal neutralization of the human brain’s censor—the thing that keeps us from swearing at inappropriate times or indulging in whatever form of behavior happens to occur to us at any given moment. The censor keeps us reasonable—with it gone, the town goes on an uninhibited spree. This is Invasion of the Body Snatchers country. Impulse creates horror by unleashing the dark forces into a recognizably decent, upstanding community. The small town, the symbol of thumbs-up American goodness, becomes suddenly perverted. It’s a Norman Rockwell painting, all right, but retouched by Edvard Munch. Impulse manages to get a few genuinely disturbing scenes on screen before its lame, blame-it-on-the-government ending. The film is also hampered by the less-than-compelling performances by Tilly and Matheson. But Impulse has quite a bit going for it, including the subversive suggestion—particularly within Tilly’s odd family—that the town already carried the seeds of sickness within itself, long before an outward accident happened to kick it off. I must confess to a built-in predisposition toward any film whose acronymic title stands for “Cannibalistic Humanoid Underground Dwellers.” This C.H.U.D. 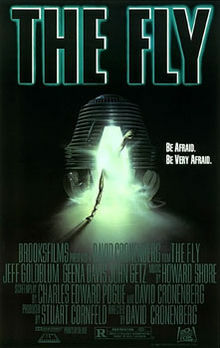 is a cheap-looking horror flick with two excellent actors in on board: John Heard, the hero of Chilly Scenes of Winter and Cat People, playing a photographer involved with the street people who live in the subways and sewers of the Big Apple; and Daniel Stern, the tall goof from Breaking Away and Diner, who has a wild role as a soup-kitchen employee convinced that something funny is going on underground. He’s right. Gruesome monsters are gobbling up bag ladies at an alarming rate, and the government is covering up. The trail of clues leads to a huge toxic waste dump directly below the beating heart of Manhattan. C.H.U.D. takes on the issues of toxic waste, street people, and stonewalling, which is more than you can say for a lot of movies these days. Unfortunately, director Douglas Cheek hasn’t got the right stuff to put this together in any sensible way, and the film barely works as a scare show. Stern, however, makes the most of his scrungy anti-Establishment role. His performance makes you confident that, in some small way, the spirit of the 1960s lives on. And so, obviously, does the spirit of formula science-fiction filmmaking. We can be thankful for both. Well, they’ll always be linked in my mind, anyway. Impulse screenwriter “Bart Davis” is actually Nicholas Kazan, and one infers that the pseudonym is a form of protest; the movie’s got a headed-off-at-the-pass quality that suggests it might have been something pretty interesting at some stage. The weird thing (okay, another weird thing) is that although Impulse is the classier, bigger-budgeted effort, C.H.U.D. actually opened at a downtown Seattle theater, the Music Box, while Impulse was relegated to the Aurora Cinema. And that’s some relegating. You are currently browsing the WHAT A FEELING! blog archives for October, 2011.